You might have noticed that a trailer - see below - recently dropped for the new Slender Man horror movie. If you did, you might also have noticed that it debuted to no small negative response online. And if you did both of those things, but haven’t been embedded in the deep, sticky goop of internet culture for the last eight years, you likely have questions. Just who is the Slender Man? Why is a (quite bad) trailer for a Hollywood movie based upon him causing more response than any other quite bad trailer for a Hollywood horror movie? And why, aside from its badness, has said trailer brought just such furious ire down on distributor Screen Gems, and parent company Sony Pictures? The answers come by way of a long, winding, and rather intriguing story, which I’ll start to explain in just a moment. Just a warning before I get going though: The story does not end well, and takes in some rather upsetting details of violent, real-life crime along the way. The Slender Man first came to life via a Photoshop challenge thread posted on the Something Awful forums back in 2009, roughly the stone age in terms of internet time. The creative thread challenged users to edit normal, everyday photos to give them a supernatural spin. There were many entries, but one in particular stuck, and immediately captured the forum’s imagination. Eric Knudsen, posting under his account name of Victor Spurge, doctored a couple of black and white photos, adding a thin, distorted, unnaturally tall, pale figure into the background, indistinct of facial features, and wearing a black suit. The first sighting of Slender Man had occurred. It’s hard to pin down exactly why the creature resonated so much harder than any of the thread’s other entries. Perhaps it was the fabricated historical quotations Knudsen added to the photos, which expertly combine conversational, mundane trappings with enigmatic abstraction and profoundly unsettling, unsaid details, in the tradition of much of the best literary horror. "One of two recovered photographs from the Stirling City Library blaze. Notable for being taken the day which fourteen children vanished and for what is referred to as “The Slender Man”. Deformities cited as film defects by officials. Fire at library occurred one week later. Actual photograph confiscated as evidence. — 1986, photographer: Mary Thomas, missing since June 13th, 1986." — 1983, photographer unknown, presumed dead." Or perhaps it was the stark imagery itself. There’s a primal simplicity to the impact the Slender Man has. He’s deeply wrong to behold, but only just. He’s depicted with a familiar shape, and familiar iconography, but he’s ever so slightly off in a way that makes him incredibly unsettling. By appearing as a broken, just-glimpsed reflection of humanity, he’s more disturbing than any number of giant-fanged, winged demons could ever hope to be. But whatever the reasons for his instinctive, collective adoption, the Slender Man was here to stay. When I say that he came to life in that thread, I don’t use the term lightly. Very quickly, the character was picked up by many SA users, swiftly developed, riffed on, expanded, and mythologised in ways far beyond the material included in Knudsen’s original post. The abstract narrative hints in the photo captions were spun to create knew facets of the character, his ability, and intent. Slightly different visual interpretations spun and stretched organically. Sometimes he had grotesquely long limbs. Sometimes he had tentacles. Sometimes he had no face. Sometimes his face changed depending on the personality and fears of those who beheld him. The most powerful side-effect of this rapid, crowd-sourced evolution though, was that rather than diluting the character, these many, subtly different interpretations solidified his myth, and added power to it. By evolving and changing the Slender Man, while continuing to build him via suitable variations on the original theme – and largely keeping the exact details of his nature ambiguous and unknowable – this swift extrapolation strengthened and consolidated the sense of the Slender Man as a folklore entity. In fact the concept of folklore is key to the whole thing. While the creature’s collaborative evolution followed the same model as an internet meme, with all the incremental adaptation, consolidation, and re-adaptation that makes any repeated online joke a living, changing entity, it also tapped into something more powerful. The evolution of the Slender Man wasn’t the usual internet process of flogging a joke from multiple angles until every last avenue of humour is expended. It was the process of growing a character, story, and mythology through collective imagination, the shared fears, ideas, and narrative understanding of a vast group coming together via endless inter-inspiration in order to create something ultimately tangible. Although a brand new character, the creation and evolution of the Slender Man was an act of genuine folklore in accelerated form. Everyone involved might have been entirely aware that that character was fabricated, but the means by which their alternative takes, tales, and distortions added to his legend perfectly parallel the creation of any number of more ‘real’ monsters throughout the ages, built by long-term hearsay and mythical word-of-mouth exaggeration. The process was exactly the same. The internet just allowed it to happen much, much faster. And so Slender Man was suddenly as close to a legitimate part of the folklore pantheon as a modern, artificially engineered creature could be. There remained in his nature a deeply unusual element, in that where older monsters without clear point of origin are defined in their ‘realness’ by exactly that otherness - that sense that they exist, and always have, outside of the bounds of human civilisation - the Slender Man came with a sense of ownership. For all of his terrifying countenance and mythology, there was also a strange, slightly warm attachment. Nightmare he might be, but he was also our nightmare. This didn’t harm him, mind. In fact it only made him spread faster. 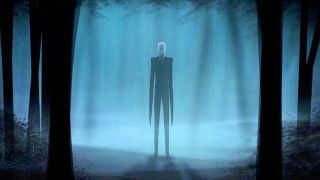 Now existing far beyond Something Awful, the Slender Man rapidly became the star of fan art, fiction, video games, short films, and even an early, first movie, which got a limited cinema release following its online launch in 2015. Knudsen remains the official creator of the character (with a still-unknown third-party taking possession of the licensing rights), but the monster felt free to turn up anywhere. But eventually, somewhere along the line, that freedom and ubiquity seemed to lead to his taking a step further away from his origins. Knudsen once stated, when discussing Slender Man’s validity as a genuine urban myth, that “an urban legend requires an audience ignorant of the origin of the legend. It needs unverifiable third and fourth hand (or more) accounts to perpetuate the myth”. And eventually, despite the creature’s nature being entirely understood by the more engaged part of its audience, in some areas he managed to cut the cord and break free. And here’s where the story takes are far realer, darker turn. It, perhaps unsurprisingly, wasn’t long before the mainstream press started losing track of Slender Man’s background. In just 2011, the Minneapolis Star-Tribune described the monster’s origins as “difficult to pinpoint”, apparently believing the Something Awful thread to be merely the breakout moment for a pre-existing creature. But alas, the disconnect didn’t stop there. In May 2014, Morgan Geyser and Anisser Weier conspired to kill their friend Payton Leutner in the Wisconsin woods. Leutner was stabbed 19 times, but miraculously survived. All three girls were just 12-years-old at the time of the incident. The perpetrators claimed that carrying out the murder was intended as a ritualistic step in becoming “proxies” – a kind of thrall in some versions of the mythology – to the Slender Man. They also said that they feared the monster would harm their families if they did not carry out the act, and wanted to prove to doubters that he was real. Now of course, the story of the Slender Man is not responsible for this tragedy. Geyser and Weier were deeply troubled, in addition to being naïve to the Slender Man’s origins, and have recently both – now 15-years-old - been committed to mental health facilities following guilty pleas, after a long debate over the correctness of trying them as either children or adults. These events were truly awful, but – as is so often the case with such events – arguably the product of troubled minds seeking out and adopting dark media to work into their existing outlook, rather than being directly influenced by it. No-one involved in creating the Slender Man mythology was responsible for their deeds. But where a sense of responsibility does come into play is in terms of Sony’s new movie. Because the trailer, regardless of its quality, sets off all kinds of alarm bells in terms of its sensitivity and appropriateness. Seeming to riff on the pre-existing idea of Slender Man controlling humans to do his bidding, it prominently features young, school-age girls, missing daughters, woodland killings, and a whole lot of implied stabbing. With such blunt parallels it’s frankly pretty amazing that it’s been released in its current form. Obviously we don’t know exactly what the plot of the movie is yet. We don’t know how closely it may or may not mirror the horrible, real-life events of 2014. But this film went into production in May 2016, two years after the fact, and has had plenty of opportunity to distance itself thematically. The producers have had even longer to plan the trailer. And so it’s pretty stunning that the movie, which (hopefully) coincidentally is set for release around the fourth anniversary of the crime, is being presented as it is. With so many parties involved, from the creative team, to Screen Gems, to Sony itself, it’s hard to know who’s responsible for the situation, understandably described by Weier’s father as “extremely distasteful”. But it’s hard not to imagine that certain Sony execs might currently be glancing between Twitter and their release calendar feeling increasingly troubled. And I can only hope they are. Because while it’s a minor tragedy that the once-vibrant, creative collaboration that created the Slender Man was eventually tainted by very real horror – though of course, this is nothing like as tragic as the horrible event itself – if the new movie were to compound the upset with insensitivity to those involved, four years later, just as Lautner and her family may be reaching some form of closure, that would be an artificially engineered horror of a whole new tier.